Creepy Crawley - Started from the bottom, still here. (Part 4) Halloween Looms..
After the last month of a few positives, an unbeaten run of 4 games and a cup defeat, we sit in 18th place. We're just 3 point above the drop zone with a superior goal difference so that should give us some form of hope. Surely we can turn October into an unbeaten month. 'Creepy October' I shall nickname it ;). Links the previous chapters: Part 1 / Part 2 - Coping.. / Part 3 - Positives, finally! First up, we start October away to Plymouth Argyle, one of the league favorites. I'd love a good away shock here as they do sit in 1st place.. Starting with a strong 4-2-3-1 Wide formation with Fenelon starting. The first half was sorry affair for us, going in 2-0 with 2 quick-fire goals shortly before half time and things were looking down. Second half comes and we managed to hit 2 goals straight back at the green army. Roarie Deacon and Gwion Edwards with the goals. Come the end of the match we were very much on the receiving end of a hammering. Plymouth finished us off 4-2 with two goals coming from star striker Sam Byrne. I'll be honest, getting two goals against the top side is a great return for that fixture but at the end of the day we've gotta get the points to get the prizes. Due to international fixtures, we've got a little under two weeks until our next match until our home tie against Luton Town. This is a game we'd enjoy a victory that much sweeter being that they are the closest team to a rival we have in this league. We start the game strong, hitting 5 shots on goal, all on target! Lisbie is on fire! Unfortunately, that doesn't convert into goals and we head into half time 0-0. Straight after half time we manage to hit Luton on a counter attack and get a thunderous ball into the box for Edwards to convert home! The supporters are in raptures! All 4,254 of them! Wonderful 1-0 win is just what we've needed and now we are back up into 18th place. We go into this game knowing a win propels us possibly to within 3 points of the play-offs, one can dream. It started off incredibly with a wonderful Gwion Edwards strike to put us 1-0 ahead with it also being Gwion's 7th goal of the campaign. This continued to be a game we dominated as we kept our lead through half time, even up until the 86th minute... only to concede an equaliser we hadn't seen coming. 1-1 was how this finished. This result put us into 19th and under a monumental amount of pressure to impress in the following game away at Hartlepool. Hartlepool, a club in 4th are our next challenge. Top scorers of the league so far and they showed this throughout our match. We went into half time 1-0 down due to a wonderful header from Luke James and this showed a sign of things to come. Another two goals went into the net and i was glad the game ended at that. Poor showing from The Reds, not only in the game but also in the league as i see we're just goal difference above the relegation zone. At lunchtime before the game, our FA Cup 1st round draw was made and our opponents for the tie are high flying League One side Port Vale. Away. YAY! Moving on... We played a strong first half against the O's taking it in at the break with the score at 0-0. And this is also how the game finished, a good result which i'll take which takes us up to 20th. With our record in the league sitting at 3 wins, 7 draws and 5 defeats at this stage against a team like York City we should definitely be up for. We play at home so even more of a bonus for the lads. Early on McFadzean gives us a courageous lead and we continue to control the first half until Kevin Lisbie gets a serious looking injury (OUCH!) We continue with our fine play with a second goal, this time from prolific goal scorer Gwion Edwards getting his 8th of the season. Going into the second half we lead 2-0 until a great counter attack from York ends in a great headed goal to give them some form of hope. Fortunately for us, we manage to end a chapter with a win! 2-1 is a great result against a high flying York City which leaves us just 5 points outside the play-off positions. WHAT A HALLOWEEN FOR CREEPY CRAWLEY! After these six games, we get a total of 8 points, 2 of each result and 5 points short of Pompey in the playoff places. Moving on up! I'll leave it there and I'll see you in a couple of days. As ever, thanks for viewing! Any feedback is appreciated and a like on my Facebook page HERE would be awesome! 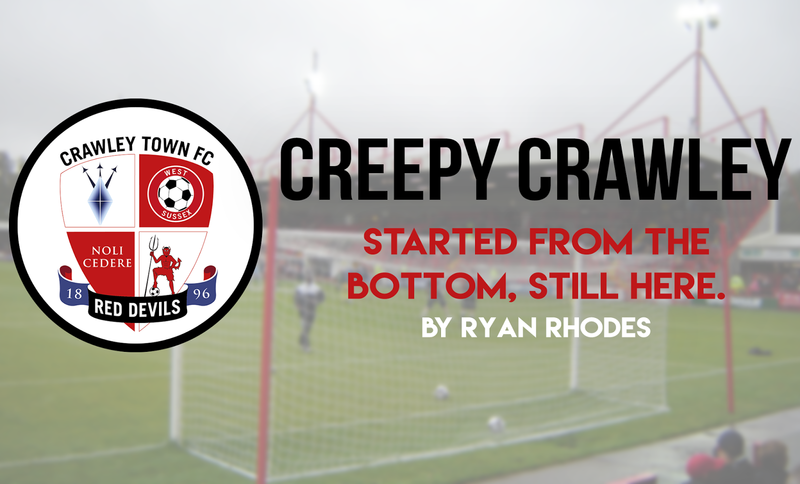 FM19 Blog - Best Football Manager 2019 Content: Creepy Crawley - Started from the bottom, still here. (Part 4) Halloween Looms..